While I am a cash-only person by circumstance (paid off the credit cards and never reopened accounts), I am so grateful that I live in a cash world. Of course, having only cash is not always convenient and does occasionally make it difficult to rent a car — but overall I am so happy to no longer be a slave to the credit card industry and the high interest rates that are overwhelming so many people around the nation.There are also so very good reasons why using only cash is completely logical. 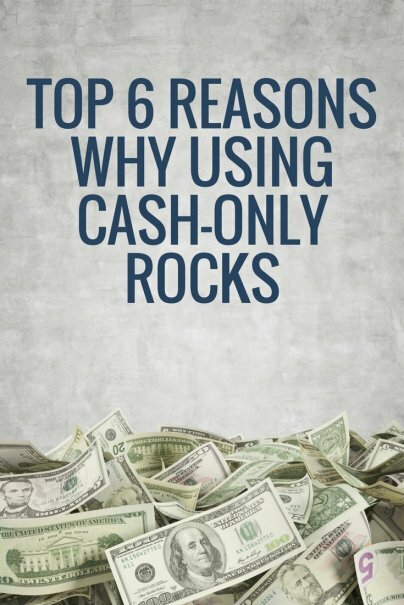 Here are my top 6 reasons why using cash-only rocks. I have had to learn to manage my money. Back when I had credit cards, I didn't think too much about what I was buying on credit. Of course I was young and not financially intelligent back in those days. Now that I only use cash, I have had to learn how to manage my money down to the penny because I have nothing else to fall back on in the way of credit. If an emergency arises, I need to know I have the cash on hand to deal with it. I have a true understanding of my needs and my wants. It has taken some time but I can now walk into a store of any kind and differentiate between the things I really need and those things that I just want. Before I would throw whatever in the cart and figure the credit fairy was there to cover me. Now I take time to pause in the aisle and really think about the necessity of my purchases. I have also encouraged the same kind of thinking in my whole family. I understand the need to wait on big purchases. Because I can no longer run out and get anything I want with a swipe of the plastic, I have to wait and save up the cash. This waiting period, highly recommended by many credit experts has really worked for me. In most cases, the stuff I really wanted because a case of out-of-sight/out-of-mind for me after a waiting period. I have used my creativity for the good. I have always been crafty but not necessarily frugal. Now, I love creating fun alternatives for usually expensive things, such as family trips, birthday parties and gifts, and other events that I used to pay top dollar for in the past. I finally do not fear the financial future. When I was overwhelmed with debt, I hated even thinking about money. Now I am excited that we will soon be debt free after a few more car payments. There are no more credit card bills hanging over my head and I have no desire to qualify for any new accounts. I am able to follow my dream. Since I no longer had big debts to fear, I felt confident to follow my dream and become a writer full time. Working for myself has been the fulfillment of one of my biggest dreams and along with financial freedom, I am thrilled to earn a living doing what I want to do each day. It will not be easy for many to convert from a credit card life to a cash-only existence but it will certainly be beneficial for you in the long run. If you are interested in changing over to a cash-only life, take baby steps away from your credit cards. Start by leaving the plastic at home when you go to the store. Slowly but surely, you too can learn to manage your life on a cash-only basis. I read somewhere that people spend 30% more when they go to a store and use a credit card. Have you seen this documented? I agree! Cash only holds you to your budget better than any other method. Scanning a piece of plastic just isn't the same as handing over a dollar bill. I've never carried a balance on my CC. The cash back rewards are great. Plus the bonus of convenience of ordering things online, the savings I get verses buying at B&M store. I agree. I think that for those who have issues with using credit cards, transitioning to a cash only system or a cash mostly system can be a wonderful thing. However, there is nothing inherently bad about credit cards. For those who are able to use them well consistently, they can be a great convenience and offer some very nice rewards. I agree, if you are disciplined, you can make credit cards work for you! By cash only are you including debit cards or do you mean only paper and change money? I am not sure if I would want to give up the debit card. Cash means cash, I would imagine—bills and/or coins tendered in payment. Why the aversion? Do you feel the need to have your entire bank balance available to you everywhere you go, or something? To Guest: I do have a check card linked to my bank account for convenience purposes that I do use but which still forces me to have the cash in the bank to use it. To GT0163C: I should have clarified that I don't beleive credit cards are inherently bad in the least. some people are able to manage them very successfully and reap the rewards they can earn. I, personally, have chosen to continue living a cash-only life because it has really been working for me and my family. I don't feel the need or the want to have a traditional credit card. thanks to everyone for all of the great comments/observations so far! I use one credit card with a reward system and pay it off IN FULL each month. Since I started using it about three years ago, I've not incurred any financial cost, interest or otherwise, and have gotten about $300's worth of rewards. If you can control your spending with a CC (and pay if off fully and timely), it can be a better deal than a cash-only system. If you don't have that kind of self discipline and hate dealing with paper money, than a Visa/MC debit card would be a great solution. I am of an opposite opinion, I feel like its necessary to do both right now. credit cards make online purchases easier, rental or services usually only take them. Also in business its essential. Can you imagine giving an employee a couple hundred bucks and asking them to pick up the last minute supplies? Sometimes thousands? Without any automatic accounting? I use the card for most things and cash only for when its necessary. The difference is that I know I have the cash to back it up. Carrying around a couple thousand in my pocket is not going to make me feel safer. With either method you have to be responsible and know you're limits. Everything that you listed can be accomplished using credit cards as well. I am 4 years debt free (except for my mortgage, which is only 26% of my income). I use a credit card for everything and pay it off at the end of every month. I know exactly when I can afford to spend, and I have worked hard to resist impulse purchases. If I want to make a large purchase I save, and when I have enough money I buy the item on the credit card and pay the card off at the end of the month. The difference is that I both get cash back and more importantly buyer's protection with the credit card. I have only had to use the chargeback option on my credit card once (after I exhausted all other options but the seller still refused to refund my money) but it was well worth it and I got my money back. I also average about $400 a year with cash back, which is free money to stick right in my savings account. The key is to be responsible with your budget in general, not to use a specific form of currency. While I see the added discipline of using cash to budget yourself, I think there is the added issue of keeping track of what you're actually buying. I prefer to use cards, be it dept or credit, and simply keep track by using financial agregate sites like www.mint.com to track everything. The site allows you to keep budgets as well as see your expenses in terms of percentages. Very handy. So while cash might keep you from going overboard, it can be like putting your thumb into a leaky dam. Money is not the enemy and making it work for you instead of you working for it is the best approach in my opinion. But rationing your money might be a good start. Sounds like some real good sense. If you can't afford something right now you wouldn't go down the pub and borrow the money off your mate. I think people should have the same attitude with the banks - you're still cap in hand borrowing however it is dressed up. I think the cooling-off period is key in big item purchases. Paying with cash forces you to avoid impulse buys. Nice post. I agree being able to start a business without worrying how to pay the rent is a great feeling. In addition, to those who don't want to quit their job and start their own company, having no debt, or minimal debt is amazing for your relationship with your employer. I always make sure to have an FU fund. Employers know when you need them because your expenses are so high you can never afford to quit your job. The minute you buy that new car or expensive house, they always seem to know, and the relationship changes. When you have an FU, or if we want to be more family oriented, SU fund, you are in a position to say, "Screw You". It is a lovely thing not working through fear! Great job on being debt free. Does anyone notice your credit rating gets screwed when you have no debt? Ughh! Good post, I completely agree that going green is the right approach. Using cash requires discipine but inspires confidence in both your ability to self regulate as well as knowing that there is not a pending backlash when the monthly statements roll in. Thanks for sharing these great reasons for using cash... I also like that I clicked for 6 and got 8... what a bargan! Thanks for your advice. I don't know if I will be able to give up my card just yet but I can see now How to use the cash I get back from it. My only concern with a credit card-less lifestyle is the need for a credit history to get financing for big purchases like a home or car. It's not impossible without credit cards but it does seem to help. However, I do recognize that you can get a car without financing by saving up, and getting a house is certainly not a necessity. Congrats on becoming debt-free and cash-only! It's always interesting to see what techniques people use to take control of their finances and get out of debt. Actually anything that incurres a bill in your name including utility bills, rent and even loans will build your credit. You don't have to have a credit card for building cedit. Also credit ratings just show how good you are at paying off a debt responsibly and that you have a history of being punctual and compleet with your payments. @Neal - the documented studies range from 18% to 22% in increased spending with magnetic strip credit cards. However, the newer cards using 'pay pass' have increased spending from consumers another 5% to 7%. The Anti-Cash Crowd - my wife and I get a lot of flack for living 'strangely' on cash, driving old cars with 250k miles+ and not upsizing our house after having two boys. Seemingly everytime I have a conversation about getting rid of the plastic, there is an incredible amount of pushback. From where I sit, I'm happy to have zero car payments, a mortgage payment less than half that of the people that think we're strange, and know that it's physically impossible for us to pile up any more debt. Cash is a beautiful thing...heck, have you seen the engraving jobs these guys do at Treasury? Damn they're good. But what about all that cash back for purchases that credit cards give you? If you can force yourself to pay the credit card(s) off each month then credit cards are much better than cash. They're cash + about 2%. Credit card companies charge the retailers 3% in processing fees. There is a gas station in my neighborhood that offers 3% discount when paying cash. Also many small businesses will give a cash discount if you ask. Instead of giving Visa the 3% and having them split it with you, paying cash helps keep the money in your community. I agree with your post. In the past, I thought I was being smart using credit cards so I could get the rewards. I always paid in full so I wasn't in debt; but I also wasn't saving what I wanted. When I switched to cash/debit card only, I realized I simply didn't spend as much. I would buy clothes, but return them later because I realized that I didn't really need them, and that the money would be much better in my account. However, with a credit card, by the time I got the bill, even if I realized I had spent WAY too much, it was usually too late to return anything. If some people TRULY don't spend a penny more using CC than cash, awesome! However, I think at least some of us will spend more. Maybe not much more; but 10-20% more. Mary, I agree with you about spending more freely using a credit card or in my case, even my debit card. I find that by using cash, I actually spend a lot less (I don't know a dollar amount, but I'm saving double what i used to). Using debit cards, I would order anything off a menu for example. If I have cash instead, I tend to be a bit choosier about what I order, and maybe do a la cart instead of a full meal for example. Glad that you have found a system that works for you. I charge everything on my CC and pay it off each month--the cash back is worth it to me. But no fancy spending--I have a tiny house and my car is 22 years old with more than 250,000 miles (odometer stopped working, so who knows?). As long as you keep the frugal frame of mind, you'll find the system that works for you. congrats to you for being cash only...it's truly anti-cultural to be that way today...your 6 points are great...hats off to you for being almost debt free...my wife and I use the envelope cash system for groceries...when the cash runs out we don't buy anything else until next pay period. Good post! Great post! I love the power and control of paying cash . . . I often joke with the cashier when making cash purchases, "Is cash okay?" They usually get the joke . . .
Not long ago I was in Macy's and bought a top, using cash. The clerk looked at me like I was an alien!! Oh, my she actually had to count back change. It looked like she had not had to count back cash in forever. Actully never counted it back, just put it in my hand. I told her please count it back. She stumbled and mumbled. Hubby and I do have a cc for car rentals, etc. But pay off at the end of the month. Also have a debit card. For some reason if we are purchasing something big, i.e. an appliance, furniture I prefer to put that cash in our checking account and then writing a check. Just further proof of purchase. And less chance of being robbed. Otherwise, we deal mostly in cash, other than big ticket items and bills. I like using cash but for me credit card is more convinient. I hate carrying coins in the pocket after some purchase. And also, I like my wallet to be as thin as possible. Thanks for the tip! It's very valuable information. I have to ask: Since you are "cash-only" do you own a home (mortgage) or do you rent? I prefer debit cards to cash. Why? I can track what I buy (or at least where I go, and I have a good memory). In addition there are certain auto-pay items that don't take cash: my tollway tag and my universal insurance policy. Congratulations on becoming a writer. I've been one for the past twenty-one years (technical) and find it rewarding, even though my career and my college degrees don't match up (BS in Business and an MBA). For the record, I do not own a home right now but did in the past. Due to an out of state move, we ended up renting until we were certain we planned to remain in the area. Thanks for the congrats on the writing gig. Like you I didn't imagine that I would become a career writer as my background is in the entertainment industry. But completely agreed that it is rewarding and a lot of fun! Glad you stopped by. Tisha, it sounds like you already made that transition, so this post should be called something more like "How using cash taught me a valuable lesson" or something like that. Sounds to me like you're ready to use your card in a responsible way and take advantage of the perks of using a credit card. I find tracking spending is much easier with my Amex than cash. I can go online anytime and see exactly what I've spent on each of my budgeted categories. Since I pay the bill every month, I consider myself to be more of a charge card user than a credit card user. I get rewards for my purchases, which is like getting an additional discount on everything I buy. And using credit responsibly has resulted in a high FICO, which saves me a great deal in mortagage interest each year. Hence, I consider my rewards card a more frugal choice than cash. I don't really understand people who use cash-only as a budgeting tool. Seems like a great way to run out of money before running out of month (how do you track where it goes? I find it just kind of evaporates...). Still, congrats on getting yourself out of CC debt and finding an approach that works for you! Just thought I'd remind the commenters who say they use credit cards so they can reserve flights, rent cars, etc - that most of the time you can do the same with your bank debit card. Most bank debit cards work like credit cards when it comes to wanting to reserve your travel arrangements or pay for things you can't with cash. To the retailer, they're receiving a credit card payment, but for the consumer, they're still on a cash-only budget. I love the idea of cash back credit cards, but for me, I know I would also be very tempted to carry a balance if money got tight once in awhile, and prefer to work out a cash-only system, too. Thanks for the tips! Thanks for sharing such great post, it will surly help many people who want such great info about finance. I have been Cash Only for decades, but now if I try to start new phone service. They say they are unable to indentify me. 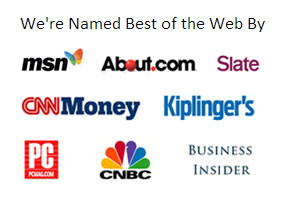 Why, because they still rely on the BIG THREE CREDIT REPORTING COMPANIES. Maybe we should have CONGRESS look into this, as I never gave the credit reporting companies permission to have my social security number, and as I always pay cash (American Dollars), why are they allowed to discriminate against me? Great post, couldn't agree more, the plastic is EVIL !! I get far more rewards with cash (or check card) using coupons and other discounts far exceed any rebate system a credit card returns. This weekend alone I had a return of around 50% using cash, pulled out the coupons. Didn't have to spend near the amount to save $300 during the course of a year. This is total BS. Credit Card is EXACTLY the same as cash - it's money. Giving up the convenience of using a credit card just because you can't control yourself makes no sense. The fact that you have a CC in your pocket and that the bank will give you credit, does not mean you can afford what you want to buy. Once you let that sink in, a CC is just the like cash, it only takes less space in your wallet and is MUCH more convenient. You just need to change the way you think about a CC and treat it as cash. We are adults, we don't need the visual queue of not seeing the bills in our wallet to know that we can't afford to buy something. A CC is even better in that way you can track what you buy since you get a monthly statement with all your transactions. So now that you have learned how to save, you can go back and use a CC again. Lighten up man. Credit cards are not the same as cash. If they were, there would have been no reason to invent them. Interest payments can kill you if you let them get out of hand. It's a fact, people spend more with credit cards than with cash. And as far as adults having to have a visual queue, what's wrong with that? I have a visual queue to let me know when I'm about to run out of gas, when my oil is low, when my lawn needs to be cut. Hell, if adults don't need visual queue's, the government might just as well gouge all our eyes out when we reach twenty-one. Also, giving up a credit card because you can't control yourself makes PERFECT SENSE. I'd hate to see you as an AA leader. Sheesh! "Friends, we're adults here. There's no reason to give up the bourbon becuase you slap your kids around when you drink it." Credit card addiction is a very real problem with some people. And another thing, if people should just treat a credit card like cash, then why not just carry cash? Are you sure you thought out your response here? And while I'm on your case. There's IS a way people can keep track of everything they buy with cash. Real easy one too. It's called a pencil. Also, when the cash is gone, you'll know you can't buy anything. You can't tell me that if you've maxed out your card and then come across that item you've been waiting your whole life to aquire shows up, that you don't whip it out. Buddy, NOBODY is that solid. I have been cash-only for a few months now. This not includes credit cards, but also checking accounts. My decision to do cash-only came about after receiving exoribitant bank fees, accrued from the bank's sneaky way of re-ordering transactions. I finally decided I was done with that, done with credit cards. Like you said, it can sometimes be inconvenient, but overall, I love the freedom. I love not having to worry that a deposit is going to be held for three days in order to clear. I love not worrying about a credit card being declined because of a sudden "freeze" on the account. I have definitely learned to control spending. It is too easy to get swept up in the idea of free money when you are only handing over plastic. When you are handing over your hard-earned cash, it changes your mindset fast! Hi Tisha, it's been over a year and a half since this blog was posted- did you achieve your goal of becoming debt free? I'm asking because I checked in a couple of times during this past year and I have become debt-free and have switched to cash for daily needs as well. I hope this finds you happy and financially fit! Cheers. The greatest advantage of cash only living is going to bed each night knowing you don't owe a PENNY to anyone else... PRICELESS. Hello Tisha, Just surfed in from the UK. As a compulsive spender, I've been looking at sites for help - everything from becoming debt-free to your cash only guide. I got rid of my credit card a few years ago which was a good move. I own a debit card which comes with my account and I am allowed a £400 overdraft. If I go over that, my card is automatically stopped/declined. I'm looking now to reduce the overdraft by half, then cancel it altogether - finally converting to cash only for essentials (food etc). As a housewife, I get weekly housekeeping from my husband, even though we are on a fixed income. It covers the basics and my husband deals with the general bills. It is good to know there is a lot of help via the internet - thanks for your advice Tisha. I agree that paying with cash forces you to avoid impulse buys. It takes some discipline to implement but I highly recommend it ! Every time I deposit my paycheck I withdraw no more than $200 to be used for the next 2 weeks. It is a tough challenge, with rising gas and food prices, but I can just about do it (I am fortunate to work locally and not pay tolls/fares). I limit my check-writing to 3 per month, if I can: Rent (utilities included), Auto Insurance, and one extra if needed. instead of using credit cards, you can use debit cards. you don't need to worry about paying interest. I recently had a fraud on my credit card so the bank will issue a new card to me in few days. I am buying everything in cash for a few days. What a liberation! I went to the food store with $30 dollars in my pocket so I am calculating in my head what are the items I need so I have enough to pay for everything. I got what I came to the store for and paid everything in cash. I saw quite a few things on sale that I would normally put in my cart if I had my credit card with me. With credit card we definitely spend more than we need to. "In most cases, the stuff I really wanted because a case of out-of-sight/out-of-mind for me after a waiting period." What??? Often, by the time I saved up for something, I decided that I no longer wanted it. One has to wonder how many of these comments are by credit card company trolls. There is absolutely nothing positive about using a card and if you are a small business you are killing yourself by taking them.